The land is something that is ever-present; the only thing that is not transitory. For Bodegas Castillo de Monjardín the "terroir" is very important, given the fact that it leaves its imprint on the very character and quality of the wines. 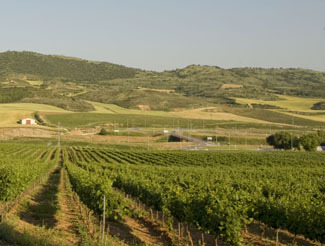 The winery is located in a favoured setting for vine cultivation, in the valley of San Esteban, in the very heart of the area known as Tierra Estella in Navarre. Our goal is to obtain excellent quality grapes of Chardonnay, Tempranillo, Cabernet Sauvignon and Merlot varieties. Therefore, it is essential to ensure that our vineyards are maintained in optimum conditions. We currently own 220 hectares of vineyards that are aged between 15, 25 and 70 years old. The vines are wire-trained to limit the threat of disease and are located on sunny slopes, cooled at dusk by the Cierzo wind during the hot summers. This excellent temperature, together with the altitude of the vineyards, located at 600 metres above sea level, are key factors in giving the Castillo de Monjardín wine its characteristic freshness.